You may have packed away your sleeping bag, tent and wellies (okay, maybe not your wellies, this is Wales after all) but any despair of festival season coming to an end can long be forgotten, at least for this weekend anyway. As Swn Festival returns to Cardiff for another year of innovating top class line-ups we can give thanks to another fantastic showcase of brilliant live music and industry talks setting itself at the forefront of any likewise inner-city events. 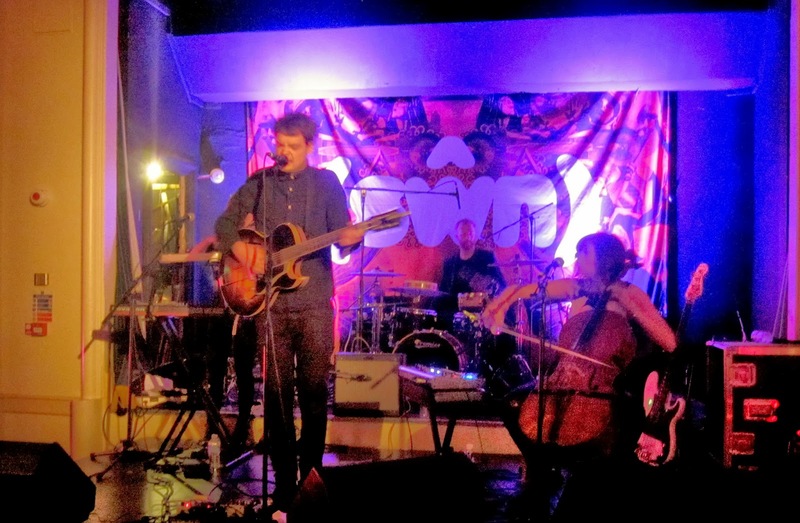 With the added and much loved inclusion of Swn Radio this year's anticipation and excitement could even be enjoyed by the many festival goers who might live outside of the Welsh capital. With interviews and showcase sessions airing all week in the lead up to Swn 2013 excitement was at an all time high. Once feeling like an Indie secret hushed through whispers amongst true music fans the festival has grown to make its presence truly known throughout the whole of Cardiff. And with the free outdoor stage returning this year again as an added bonus the message of Swn can only get bigger and better. As I rolled in to the city late on a Thursday evening things were well underway and this already looked to be the best Swn yet with Womanby Street decked out in its colourful decor amongst the bustling crowds. With my swanky wristband firmly secure I made my way down to the newly appointed venue, The Angel Hotel, for what was to be my first act of the weekends festivities. Yep a hotel. I'm not sure what swung the deal for them to allow a load of rowdy music lovers to wreak havoc on their fancy carpets but it was a great addition. As Chloe Howl swayed her way on to the stage with Rumour it was clear to see just why she's received so much attention lately. Reminiscent of a cooler, more poppy Lilly Allen it's not long before her energy translates to the crowd who seem to be warming up nicely. Blending catchy, accessible melodies with driving basslines and crystalline vocals makes for an infectious listen. As she rounds up her 10 track set it's safe to say the chorus for No Strings will be lodged in to many peoples heads for the rest of the evening. 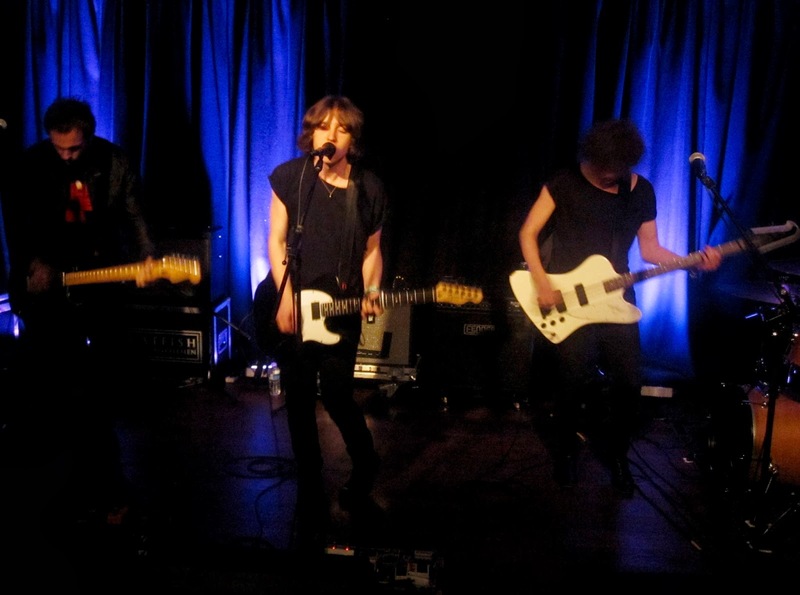 Next up was the promising Welsh band Catfish And The Bottlemen. Making waves across the country with cleverly thought out Indie it was a good job we got there early before the packed out Dempsey's became one in one out. 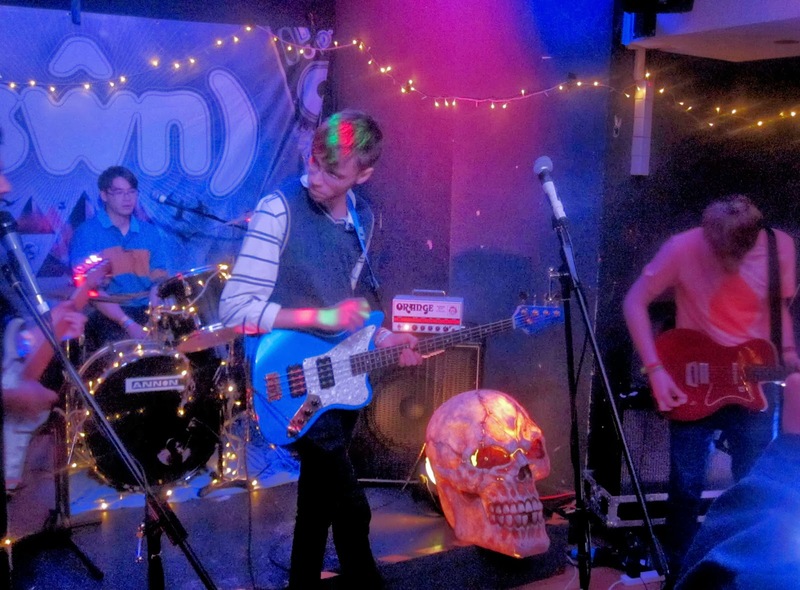 Snarling their way through an impressively bright set with long drawn out guitars and thundering percussion the North Walian four-piece give a shot of pure adrenalin to modern day guitar music. Driving their way through an energetic set featuring hit singles Rango and Homesick the big favourite seemed to be their latest effort Pacifier. The glazed vocals and subtle tempo shifts through piercingly beautiful guitars would have definitely earned them some new fans tonight. With rumour of the Everything Everything gig already being sold out and having seen them on their recent UK tour I opted for the short journey to Clwb Ifor Bach for Sunderland's Frankie & The Heartstrings. 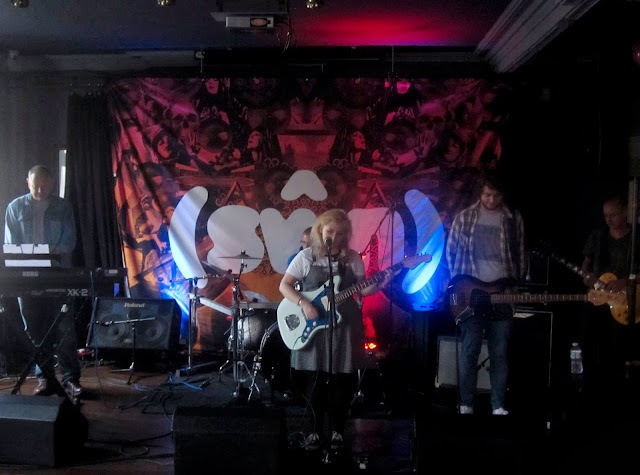 Whilst I managed to catch them at Swn 2012 (and not to downplay that performance as it was great in its own right) I can't help but feel their music sounds a lot better suited to this smaller venue than Cardiff's The Great Hall. 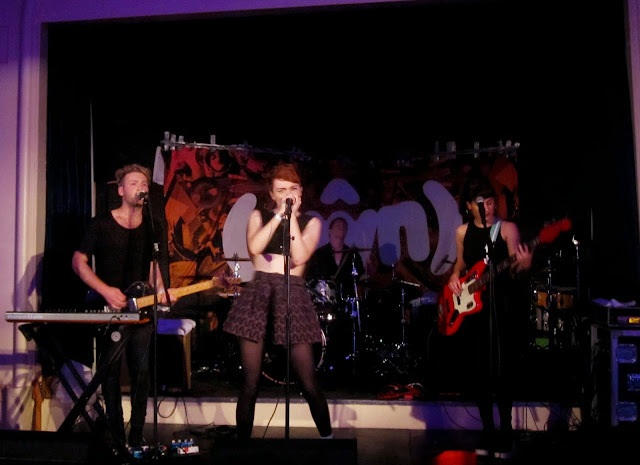 Playing to the packed out crowd with their signature fast paced vocal delivery and jangly guitars it's clear to hear their vast array of influences. As the band joke around on stage about killing a pheasant on their journey in to Cardiff, by accident I might add, we can only give thanks for their determination to make it to the show on time. As they round up a brilliant performance it's only a short walk back to the Angel Hotel to catch Ghostpoet take to the stage. With minimal lighting, almost so dark you can hardly see any band member on stage, it's the unique style and take on spoken poetry and rap bellowing from the speakers that confirm the show is well underway. Charming the Welsh crowd with stylistic melodies delivered in a cool, calm and collected composure his confidence echoes through the audience as he shouts "are you having a good time Cardiff". Sadly my enjoyment has to be cut short due to a clash in order to make my way back to Clwb Ifor Bach for the delightful Sky Larkin. I try planning every year in advance but with bands not sounding the same live as they do on record I've found you often miss fantastic performances. A live music festival should always be judged fully on the live music and not studio recordings so stumbling in to venues I feel is a must, just is the case here. Not too familiar with the Leeds based trio, although with plenty of people talking them up over the course of the evening, I made my way upstairs to be met with a truly worthy display of heartstrung vocals and hazy guitar pop. It's quite shameful they've been around for years and this is my first proper listen but I guess it's better to be late to the party than to never show up at all. 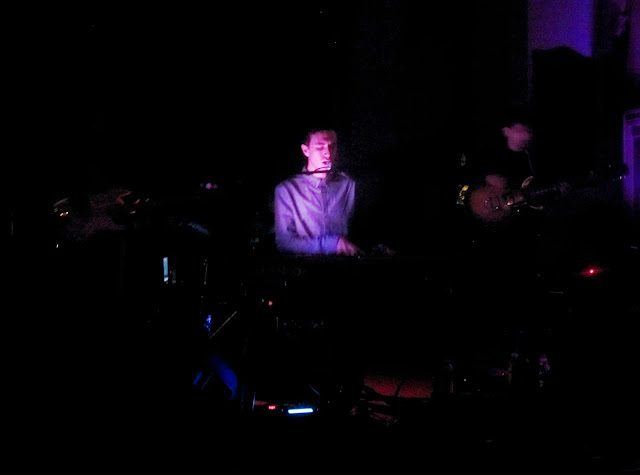 With day one complete and our aching feet and ringing ears having plenty more to look forward to it only made sense for the warming Synth Pop charm of Pawws to kickstart Friday's proceedings. Through pulsating basslines and throbbing synths Lucy Taylor's vocal clarity is really something that needs to be heard. Proving to be a bloggers dream as her almost overnight hype has exploded in to the Internet domain Pawws is sure to be far from another one hit wonder. As she picks up a flute my mind wonders how this will ever work with her current style but wow, work it does. Hopefully an album isn't too far away. 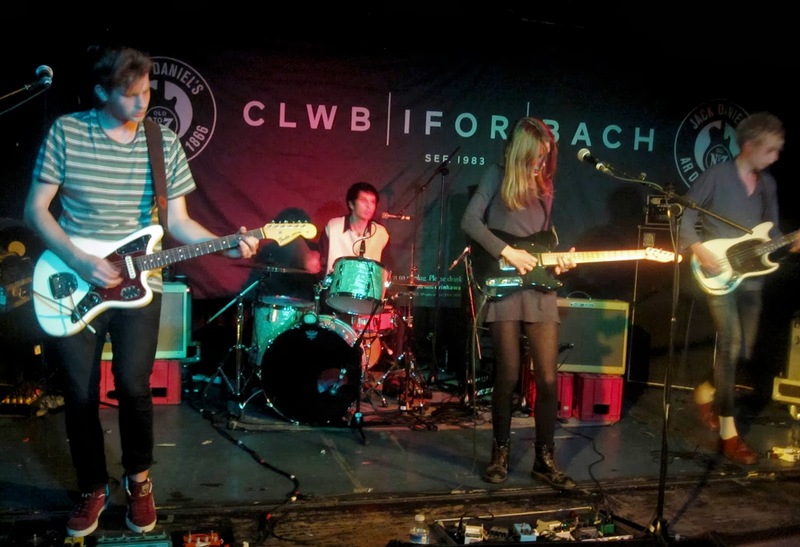 Clwb Ifor Bach seems to be the main hub for tonight. With a 30 minute wait for the next act I head downstairs in the hope of catching Heavy Petting Zoo's iconic dancer. Sadly (I say as if that was a bad thing) it was packed and I had to settle for the sounds rather than the sights but I guess I could live with that. Hailing from Swansea their heavy punk rock tones are a welcomed sound amongst the receptive crowd. Making my way back upstairs for a big favourite of mine I find myself at the front for Wolf Alice. My third time seeing them in Cardiff they never disappoint. Performing a slightly different set to their recent stint with Indie new risers Swim Deep they pack in the more heavy numbers, I guess relating to the more music conscious crowd. In stark contrast they readily begin to roll out their warm, voluptuous melodies, the addition of crashing cymbals and big kick drums only adding to their brash 90's reviving sound. After a slightly longer wait than expected eccentric Acid Punk rockers Bo Ningen finally make their way to the front stage. Unlike anything else on the line-up the Japanese four-piece no doubt quite rightfully pack out the venue. Trying to sum up their music in to a few short sentences is never going to be easy with such vast musical soundscapes ranging from psychedelia to metal to just plainly and simply distorted noise. With a stage presence like none other as they swing guitars high above their heads, flailing around in their own uniquely created dimension through a sea of long black hair, they've most certainly stamped their presence well and truly on Cardiff this evening. As Swn rolls in to its third day there's no signs of things taking a slowing pace. With an almighty downpour I opted for a later start making my way to Brothers between sporadic showers. As regular readers will know I don't like to write critical reviews but there wasn't a lot going on for the young psychedelic Cardiff band. The music is there and I'd like to say with more direction and their young age they'll improve over time but with a poor attitude and little respect for anyone but themselves (flicking the lights on/off during Ghostpoet's performance) I'm not so sure. There's living up to the rockstar image....then there's being a dickhead. 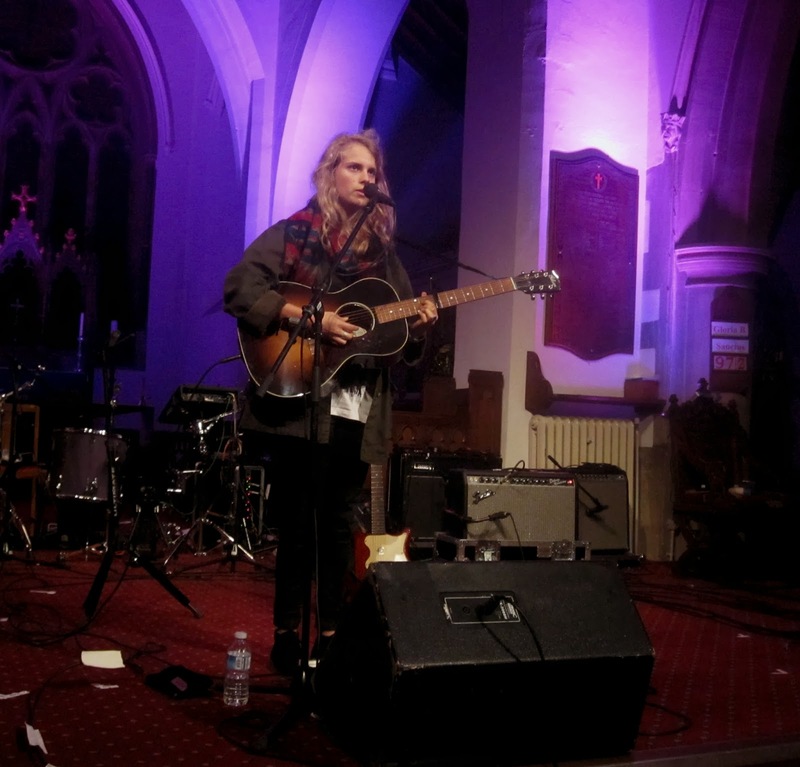 With Marika Hackman and Fryars heading up the same venue, a short taxi journey from the city to St John's Church in Canton proved to be well worth the excursion. Whilst I'm not a huge fan of having to make such a trip away from the hustle and bustle of all the other venues I can't help but think no other musician would be better suited to that of a church. 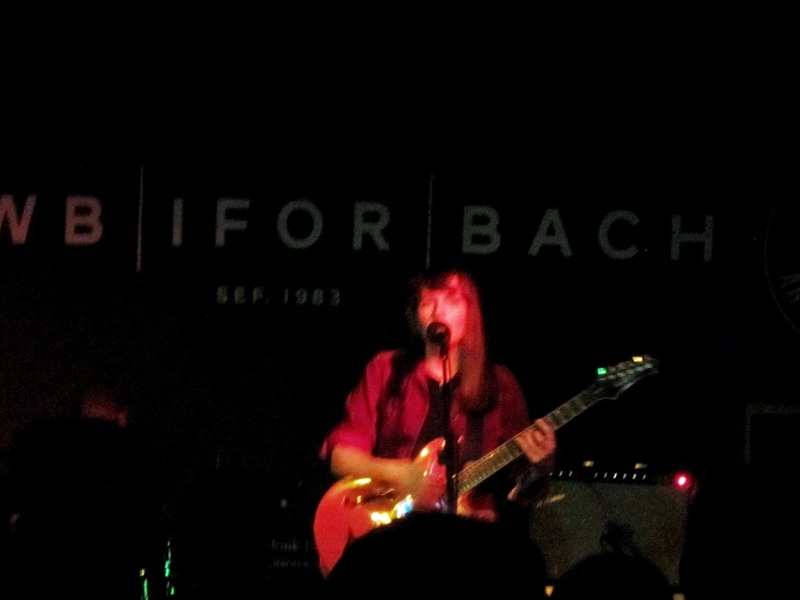 With fantastic acoustics, Marika Hackman's angelic vocals echo around the high ceilings. 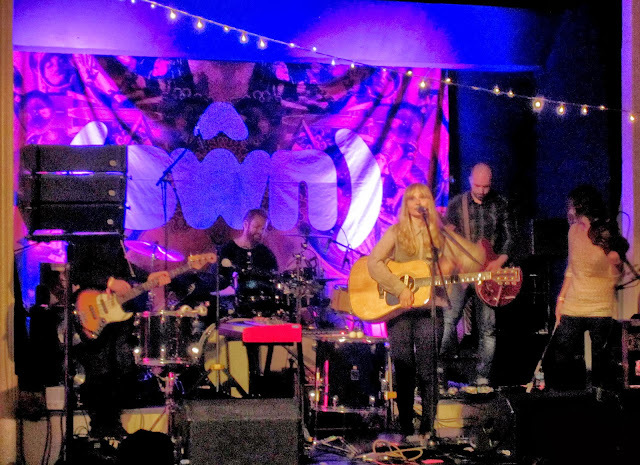 Through some pretty funny banter mostly relating to her rather depressing song narratives Hackman leaves us clinging to each and every word whilst lashings of folk-infused melodies and glistening tones form a stark contrast through their dark imagery. A raw and prominent reminder that everything is not always as it seems documented beautifully through her applaudable lyrics. New single Cinnamon proves to be as equally haunting with its organ-like guitars and holy-esque vocals. You can't help but fall in love with her bashful charm as she apologises for swearing in a church. Hopefully we won't have to wait too long before she comes back to Cardiff to play. After a short wait Fryars took to their positions as cinematic projections began to shine above. I wasn't quite sure how their Synth-guitar Pop would sound in such a reverberated space but opening with their latest single The Power it was clear to hear just how well it did. With almost auto-tuned vocals gliding above the empowering percussion Fryars proves to be equally as energetic as he is endearing blurting out "I'm a little different to myself, Ima make a beeline straight to hell" on the sentimental track On Your Own. Let's hope not though being in a church and all. With a musical style forming a cross-section between a more upbeat Halls and Gems, 22 year old Benjamin Garrett has an impressive skill for making you completely satisfied with feeling so lost and empty. It's a strange feeling for sure but something I love as his piano build ups cascade in to plummeting drums and monumental guitar solos. Leaving Canton with a big smile on my face I thought it was only right to check out some Welsh talent so a quick stop off at Jacobs Market for Peski's takeover was next on the list. Making my way to the top floor (what a work out, maybe I'm just unfit) and through the sea of trendies I managed to catch the last few tracks from Gwenno's blissfully gorgeous set. Transfixed on the glittering lights and her adorning style the Synth-Pop Welsh language songster was a true delight, Jacobs Market proving to be an excellent venue packed full of creative types mingling amongst one another. After partying 'till the early hours on Saturday with very little sleep day four of Swn was always going to be a big struggle. At 23 I should be bouncing with joy but with a sore head and a back resembling what only can be described as something similar to slipping a disk I pulled myself together and headed back in to town, eased by the promise of all the brilliant music on show today. All I can say is thank heavens Lanterns On The Lake were switched until later on in the day so I could have that extra lie-in. So as the rain cleared once more I made my way through town stopping off at the newly returning outdoor stage. Rhodri Brooks was gathering quite the crowd as he divulged his slow crooning vocals and plucked electric guitar. Having already played with a full band on Saturday at O'Neills here we got an even further insight with an exquisite solo performance. Next up was Elly Sinnett over at Four Bars. I'm not quite sure what it is with singer songwriters but my do their audiences like to sit down. Tip-toeing through to the back avoiding the feet and hands sprawled on the floor Elly's set began with a fiery warmth. At just 18 her vocal talent provides a true breath of fresh air from the X-Factor generation of young musicians through fragility and piercingly beautiful lyrics. Shy and bashful it's hard not to fall in love with her playing style much akin to Daughter and with an EP on its way I'm sure it's not the last time we'll be hearing her name. With a short walk across the pavement I managed to get in to a great position at the intimate Fuel Rock Club for Radstewart. What would be my third time it's been fantastic to see them improve at each and every gig. With stark and quite frankly honest lyrics "If you go out and get DRUNK in a Native American headdress, then you're a C*NT" there really is no one quite like Radstewart in the scene. Their jangly guitars and distinct sarcastic vocal delivery through a garage DIY-like sound remains to be as prominent as ever. Try not to fall in love with their awkward allurement. After almost forgetting Lanterns On The Lake had changed to the later slot I managed to get there just in time before the Newcastle five-piece took to the stage. Through a powerful display of almost Post-Rock Indie the band put on one of the most powerful performances of the weekend. Now, I'm not sure if it was because I was tired and hungover but their emotional display of spiritually gorgeous music was more than enough to sweep me in to a dazed like state. Switching between instruments (I think all members bar one had a go on keys) their playing abilities are clear to see through this endearing musicianship. It's not often I say this either but the crowd was absolutely perfect. No one talking. No one muttering to their friends. Just 100 percent respect for a band that wholeheartedly deserved it. Sadly the change in times had now meant I'd missed Nanook Of The North, a band I've been wanting to catch for quite some time. Hopefully I'll get another chance soon though after being overly amused and impressed with their innovative promotion of origami gig reminders that were found all throughout the Swn venues. After a quick stop for food I made my way back to the frequented Clwb Ifor Bach to catch Childhood. After missing them last year I was amped to finally hear their sun-kissed melodies in the flesh and they far from disappointed. Running in a similar vein to Palma Violets and Jaws their tropically doused guitars channel mid 80s Indie-Pop riffs amongst ethereal Shoegaze rhythms. 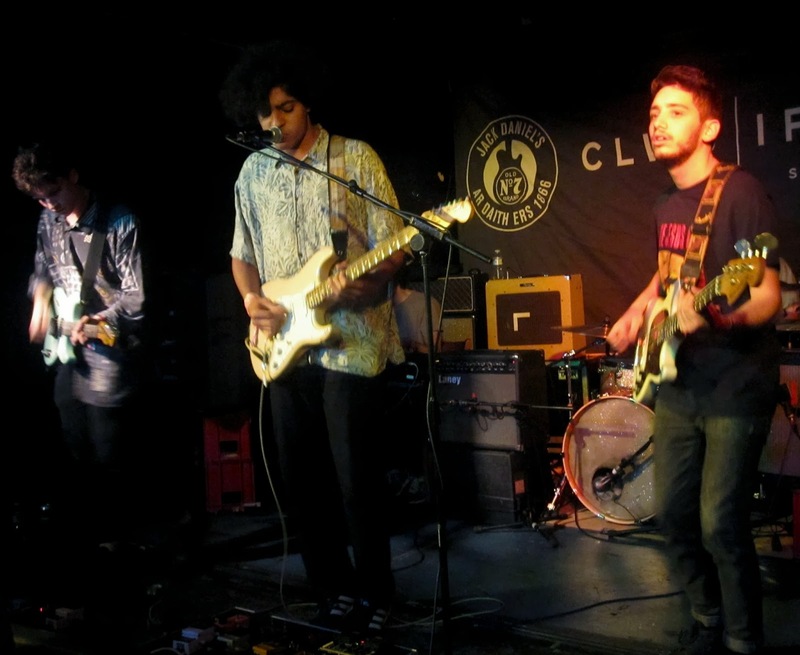 With soulful, percussive drives and grooving basslines, the London four-piece manage to create a sound that's ever so nostalgic yet impressively new. As the festival edged in to its final stages the main act for me over the weekend would have to have been Sivu. Having banged on about him numerous times on the blog and over the weekend to anyone and everyone that would listen I made my way down to the front of The Angel Hotel. Apologising for running a little late the band wasted no time in delivering an unparallelled range of sentiment. Watching the searing emotion run across James Page's face as he blasts out his astonishingly powerful vocals is more than enough evidence to showcase his devoted passion. New single I Lost Myself sounded exceptionally good and with an added Cello to the line up the accompanying band sound so carefully constructed. Through haunting lyricism and a soulful nod to the mellower side of Pop Sivu is definitely not one to be missed. Whilst I would have loved to cram in even more new musical discoveries over the course of the weekend Sivu marked the end of my Swn festivities, just in time before my feet, legs and back gave way and I would have needed to be carried home on a stretcher of self pity. Even the thought of partying 'till 4am at the iconic Dim Swn was enough to make my body ache with fear. Womanby Street might take some getting used to without all the delicately palced Swn balloons, banners and busy party atmosphere emerging from the bars alligning its path but one thing can be taken from this......2013 was its best year yet. Diolch yn fawr Swn, I'm already counting down the days until 2014 and with an extensive fitness regime maybe I'll be able to last out that little bit longer, who knows!